Kick it riverside this NYE! The Brisbane river. The mighty brown snake. We’d never want to swim in it but we sure love being around it. Whether cruising on the ferry, knocking back Milton mangos, sipping on spritz or watching the rowers glide past, we can’t get enough of that sweet, sweet water. It seems only right then to farewell 2017 and welcome 2018 gazing adoringly at it, so for you we present, the best riverside NYE parties. The fireworks won’t be the only thing on display at Byblos this New Year’s Eve! Raise your glass and marvel at the 5 ½ hour premium drink package including cocktails and mouth-watering food stations. With two fireworks shows (8.30pm and midnight), as well as live entertainment and DJs, put on your dancing shoes and spring into 2018 on a high. At $199 tickets won’t last long, so book in here now. We’re struggling to think of a more romantic way to bring in 2018 than with Midnight in Paris. Party like a Parisian in the front bar with French martinis and chandon. Head upstairs and cancan into the Moulin Rouge with dancers and dessert bars or celebrate in the courtyard next to the Eiffel tower with pop up champagne and aperol spritz bars and food stations. The Walrus Bar will be kickin’ it flapper style and rocking into 2018 with a rockabilly band. Tickets from $140, book here. Searching for that final feast of 2017? Don’t know watt you’re going to eat? Watt is wattsup. New Farm’s beautiful riverside restaurant that really gets our need to line our stomachs with great food before we get swept up in the eve’s celebrations. Kick off your evening by dining on an exquisite three course meal, with a three hour drinks package and awesome live entertainment. Dinner wraps up at 9.30pm, making it the perfect jump off point for a ferry ride into the city – because you’re never too old for fireworks. Tickets $99+bf. Book here. 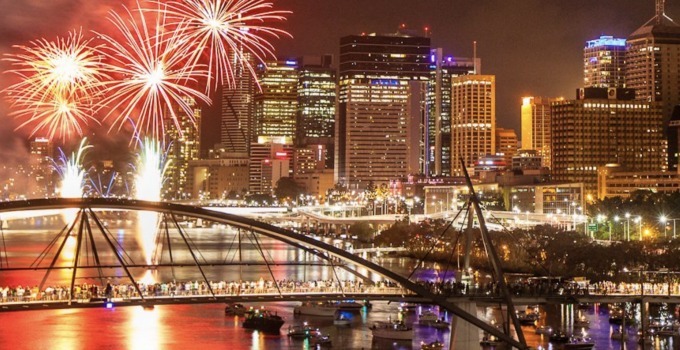 Keen for a bird’s eye view of the fireworks on the river? You can’t get much higher than the rooftop bar at Eagles Nest. Ride the elevator all the way to level 12 for spectacular views of the Story Bridge, majestic brown snake and city skyline. Feast on tasty treats including panko coconut prawns, Moroccan Wagyu meatballs and pork belly as you enjoy the 5-hour drink package for $225. Feeling super fancy? Forgo battling the crowds for a taxi and uber surges and book yourself a night at The Point Hotel. Hello buffet breakfast, good bye hangover! Crunchy salt and pepper calamari, macadamia nut barramundi, tomahawk steaks and crispy whole skin fish – River Quay Fish knows we refuse to enter the new year hungry and they are putting on a feast. With two sittings, a 3-hour food and drinks package and sweeping river views you’ll have the most luxurious start to the year possible. Tickets start at $70 for adults and $40 for kids, book in now before they swim away! Grab your floaties and snap up some new swimmers – it’s pool party time. With DJ Jeff Chaux spinning tunes from 7pm, pop-up bars of Brookies Gin & Red Bull, luxe catering and a VIP Lounge, pool side at Soleil Pool Bar is the place to be this New Year’s Eve. Sip on premium beverages or pop bottles in the Champagne Lounge, whether you want your year to end with a slow burn or a bang – there’s something for everyone. Words by Emma Callaghan – the gourmand who’ll be cracking open a few Milton mangoes on the river this NYE.